Philadelphia has struggled as a favorite this season but on Sunday with the NFC East on the line, the Super Bowl champions are back in their preferred underdog role against the Cowboys in Dallas. Philadelphia has struggled as a favorite this season but on Sunday with the NFC East on the line, the Super Bowl champions are back in the underdog role +3.5 against the Cowboys in Dallas. 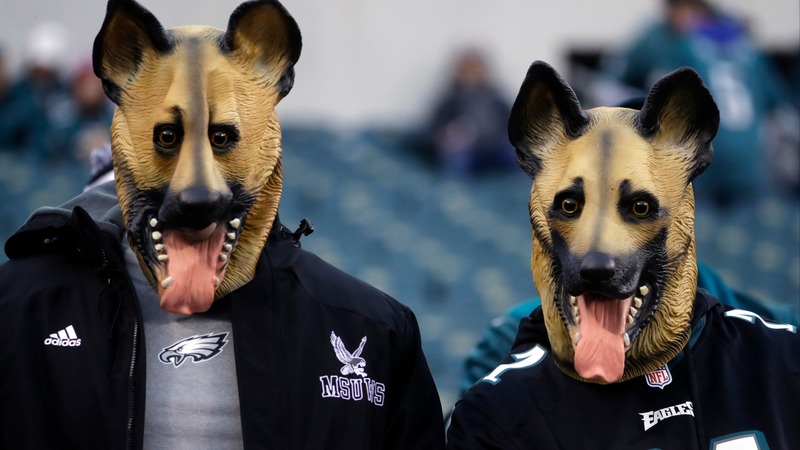 The Eagles embraced the underdog role last season in the playoffs but have closed as an underdog just once this year, a 48-7 loss to the Saints. Still, coach Doug Pederson's team is 6-3 ATS as a dog in their last nine games and has covered three of the last four at Dallas. __MORE:__ [Oddsmakers adjust Chiefs futures in wake of Kareem Hunt turmoil](https://www.betchicago.com/super-bowl-53-odds-betting-lines-playoff-picture-chiefs-kareem-hunt) Sunday afternoon's game is essentially a playoff game for the Eagles, who are +300 to win the NFC East at the Westgate SuperBook. A loss essentially knocks them out of the [division race](https://twitter.com/MarcusDiNitto/status/1070368973995343873) and drops thier playoff chances to 19 percent. Win and the Eagles control their own destiny with a tough remaining schedule. Off a giant win over the Saints, the Cowboys don't *need* Sunday's win as much as the Eagles. The situation puts the Cowboys in a slight letdown spot ATS off its fourth straight win, something reigning Super Bowl champions have had ATS success with in the past. [According to](http://playbook.com/Marc-Lawrence/) Marc Lawrence's Playbook, defending Super Bowl champions that are road dogs facing teams off back-to-back wins are 20-6 ATS and 7-1 ATS in division games. The Cowboys have also struggled ATS as a home favorite under coach Jason Garrett, going 16-33 ATS and 5-19 ATS as a home favorite off a win. Historical trends should be taken with a grain of salt and the fact the Eagles' last two wins were against the inept Giants and Redskins team that finished the game with Mark Sanchez makes us lean to the Cowboys side. # NFL Week 14 late afternoon games betting rundown ## Eagles at Cowboys betting lines & trends 3:25 p.m. CT on FOX __Point spread:__ Cowboys -3.5 __Total:__ 43 __Betting trends:__ Eagles are 10-2 straight up in their last 12 games vs. NFC East. The visiting team is 11-3 ATS in the last 14 games between the Eagles and Cowboys. UNDER is 15-6 in Cowboys' last 21 games overall. __Also read:__ [NFL Week 14 power rankings](https://www.betchicago.com/nfl-week-14-power-rankings-rams-return-to-top-spot) | [NFL Week 14 opening lines](https://www.betchicago.com/nfl-week-14-opening-lines-bears-dreams-of-rams-upset-ride-with-trubisky) ## Broncos at 49ers betting lines & trends 3:05 p.m. CT on CBS __Point spread:__ Broncos -5.5 __Total:__ 45.5 __Betting trends:__ 49ers are 1-7 ATS in their last eight games as a home underdog of 3.5-10.0. UNDER is 10-3 in Broncos' last 13 vs. a team with a losing record. Broncos are 6-1 ATS in their last seven games overall. ## Bengals at Chargers betting lines & trends 3:05 p.m. CT on CBS __Point spread:__ Chargers -14 __Total:__ 48 __Betting trends:__ Bengals are 1-6 ATS in their last seven games overall. Chargers are 4-12 ATS in their last 16 games as a home favorite of 10.5 or greater. Over is 6-2 in Bengals' last eight games as an underdog. ## Lions at Cardinals betting lines & trends 3:25 p.m. CT on FOX __Point spread:__ Lions -2.5 __Total:__ 40.5 __Betting trends:__ UNDER is 10-2 in Cardinals' last 12 games as a home underdog of less than a field goal. Lions are 1-5 ATS in their last six games overall. OVER is 5-1 in Lions' last six games as a road underdog. ## Steelers at Raiders betting lines & trends 3:25 p.m. CT on CBS __Point spread:__ Steelers -10.5 __Total:__ 51.5 __Betting trends:__ UNDER is 13-3 in Steelers' last 16 road games vs. a team with a losing home record. Steelers are 4-10-1 ATS in their last 15 games as a favorite. Raiders are 1-5-1 ATS in their last seven games as a home underdog.